We’ve had an AMAZING summer this year. We’ve been going to the pool, beach, lacrosse, baseball tournaments and camp. I recently received my credit card statement and I can tell by the amount how much fun we had! My husband and I decided to start getting back to normal and we put our family on a no eating out monthly challenge. I can tell you right now that this is much harder on my kids than it is on us! I’ve had to plan a little bit more and make sure I had some backup meals in case we stayed out longer than expected. I even packed a cooler lunch when we went to the local theme park, Carowinds (We have season passes). My kids thought I was crazy! Since we weren’t eating out I’ve been making extra treats at the house. I’ve made cookies, ice cream cakes, and some homemade appetizers. It’s helped us all when we feel like we were missing out. 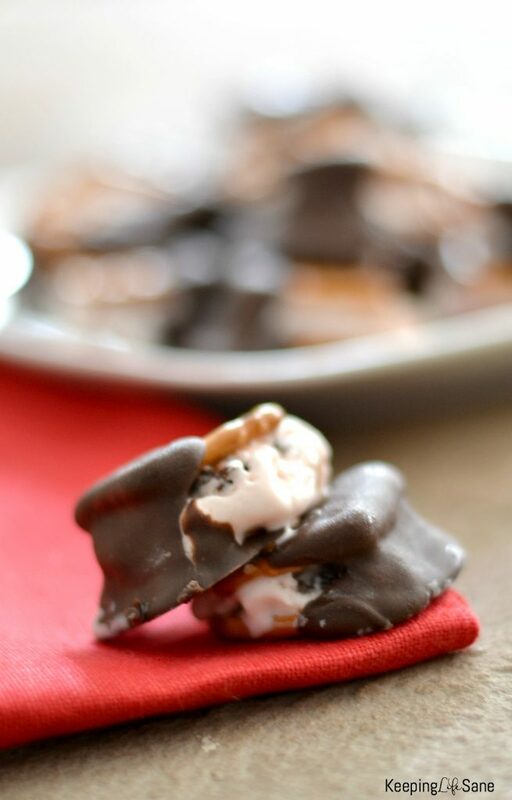 These ice cream pretzel bites and so easy and fun to make. My kids were loving it. They’ve been getting bored now that it’s the end of summer so I’ve been trying to keep them busy and put them to work on these treats. 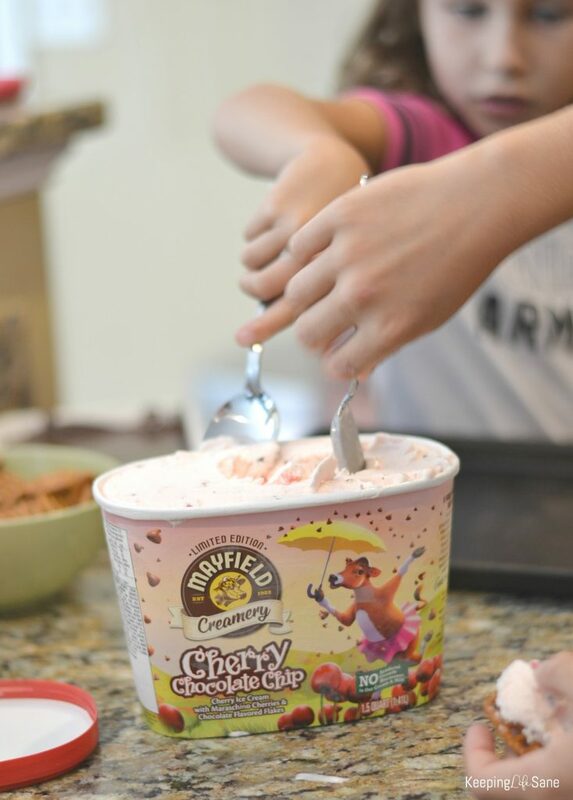 We found this limited edition Mayfield Cherry Chocolate Chip flavor at Publix (you can use this store locator to find Mayfield at your local grocery store!) They were loving the carton. Mayfield has been around since 1923 and recently went back to their original name, Mayfield Creamery. I’ve actually visited a Mayfield dairy before and know they use fresh cream from real dairy with no artificial hormones. Melt dipping chocolate so it’s ready to go. 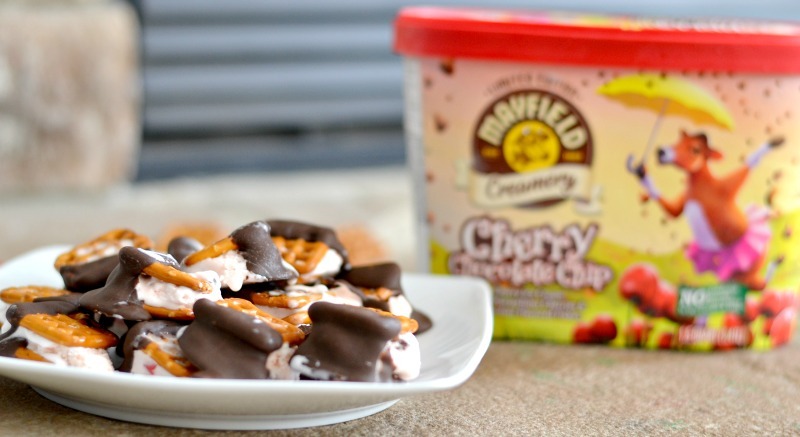 Scoop a tablespoon of Mayfield ice cream and place on a pretzel. Place the second pretzel on top. 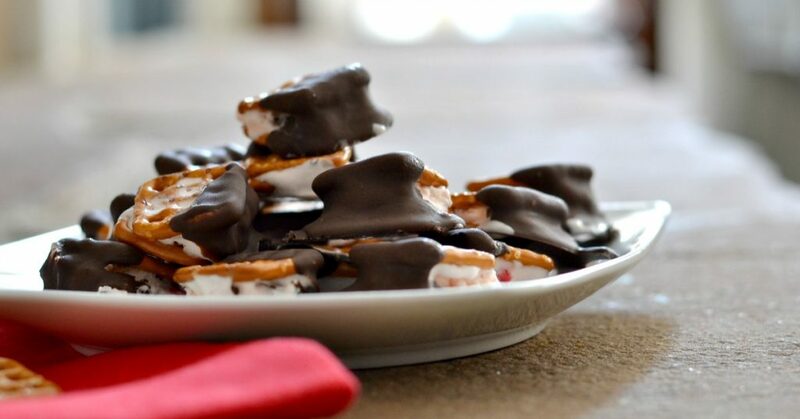 Quickly dip in melting chocolate in a scooping motion to really get the chocolate on half the pretzel sandwich. Place on baking sheet and freeze for 1-2 hours until firm. 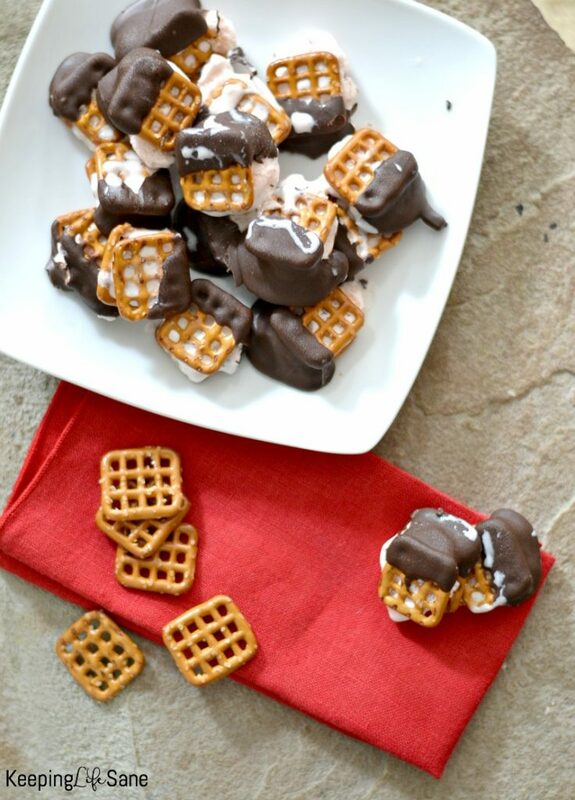 Take the pretzels off your pan and place in a freezer storage bag or container. These were definitely a hit. We all loved the salty and sweet in the same bite. 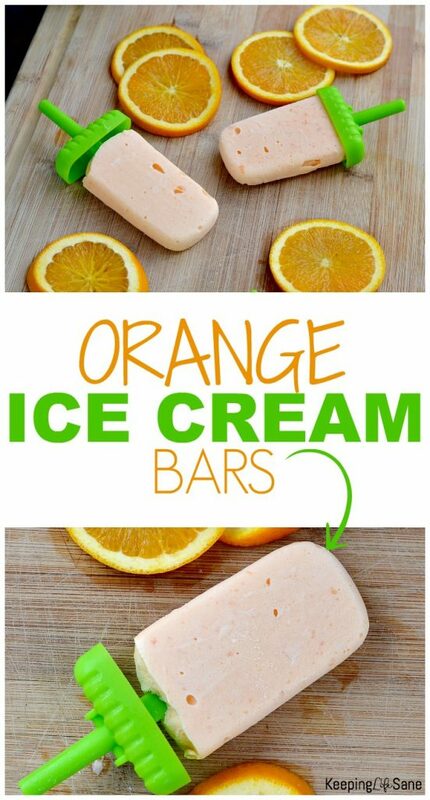 I’m sure your family will love making and eating these too. 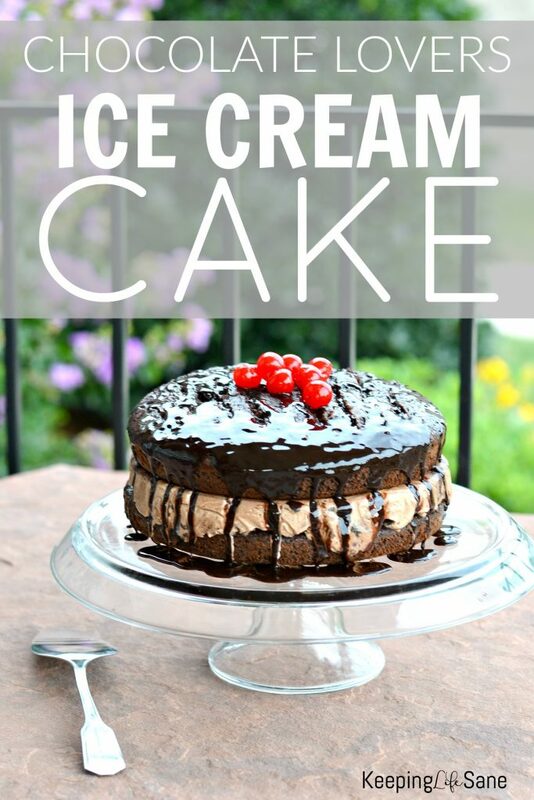 You may also like these ice cream recipes.